Why Are My Biscuits Always Flat? Can I Store Biscuit Dough Overnight? Why Do My Biscuits Turn Out Hard and With Cracks? Do You Have to Bake Your Biscuit Dough Immediately? You can also freeze baked biscuits and simply reheat them. 1 Why Are My Biscuits Always Flat? 2 Can I Freeze Unbaked Biscuits? 3 Can I Store Biscuit Dough Overnight? Humble baking powder biscuits are true workhorses in the kitchen. Slather them with butter and jam for a simple snack; fill them with scrambled eggs or ham for hearty sandwiches; or top a chicken pie filling with them for a substitute for pie crust. However you use them, baking powder biscuits are at their freshest when baked immediately. In a pinch, you can get a head start on a meal by refrigerating or freezing them. 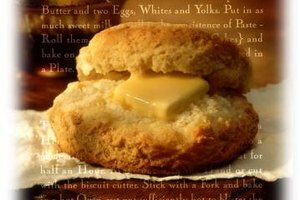 The secret ingredient behind a light, fluffy biscuit is almost always baking powder. Baking powder, which is made from baking soda, cream of tartar and cornstarch, begins its bubbling action when combined with moisture, such as buttermilk, cream or butter. A second reaction occurs when baking powder meets heat -- when you slide the biscuits in the oven. You can refrigerate biscuits for a few hours, but they might not rise quite as high because the bubbles produced by the first reaction will have already dissipated. Although you can refrigerate baking powder biscuits for a few hours, other options might work better. Freeze uncooked baking powder biscuits, which seems to preserve the leavening action better than refrigerating. Place the biscuits on a baking sheet and freeze them until they're hard. Then place them in a plastic freezer bag or container and freeze them at zero degrees Fahrenheit for up to three months. Whether you need three biscuits or a dozen, simply pull out some biscuits when you need them and bake them at 425 F for eight to12 minutes. Another option is to prepare the ingredients ahead of time, but mix them at the last minute. Combine the flour, baking powder, salt and any other dry ingredients in one bowl. Cut the butter or shortening into 1/2-inch cubes. Refrigerate both the butter and the dry ingredients. Cut the butter or shortening into the dry ingredients, add some buttermilk or cream and you've got ready-for-the oven biscuits. If you really want to refrigerate biscuit dough, opt for angel biscuits, rather than regular buttermilk biscuits. Angel biscuits contain both yeast and baking powder for almost guaranteed success. They will taste better if they're refrigerated overnight. Because they have yeast, they need to rise for about two hours once you've taken them from the refrigerator, but they turn out light, tender and buttery. For a simple, down-home food, biscuits are surprisingly tricky to make. Too often, they resemble hockey pucks, rather than the light, layered bread you're hoping for. Whether you refrigerate, freeze or immediately bake biscuit dough, a few tips can improve the taste and texture of your biscuits. Use a soft white flour that's low in protein, such as cake flour or pastry flour. Replace your baking powder every six to 12 months so it's fresh. When combining the ingredients, use a light hand. Over-mixing encourages gluten formation, which leads to tough biscuits. Can You Make Croissants With Baking Soda Instead of Yeast?